Tired of juggling keys? Looking for a simple but effective way to secure the door to your home or business? A keypad door lock allows you to gain access by punching in a custom code. You can even store access codes for other family members or friends, which means that you can open or limit access to your home as needed. Let’s learn all about keypad door locks and explore some of their key features. The most important feature for a keypad door lock is arguably the number of access codes which the lock allows you to store, and the procedure for changing those codes. 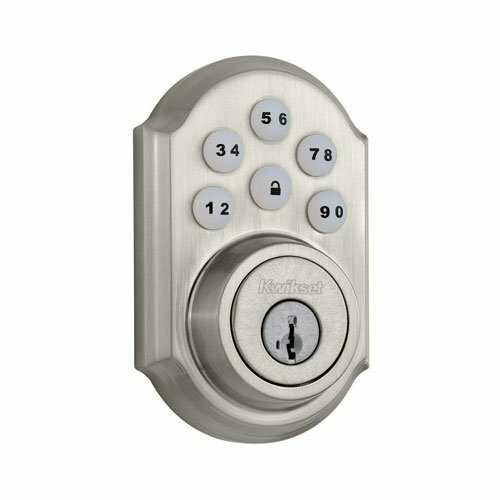 Along with a master code, most keypad door locks will allow you to store at least several additional codes, but sometimes more than a dozen. Ask yourself how many people need codes to the door. Is it just you? You and a couple of family members? Do you go on vacation sometimes, and want to provide a code to a neighbor to use? Are you shopping for a business setting, where you may have a dozen employees who need their own codes? Do you regularly bring contractors and temps in and out of the workplace? Will you be changing the codes frequently? Your answers to these questions can help guide your buying decisions as you evaluate different keypad door locks. Something really basic with just a couple of codes may be fine in many cases, but in other situations, you might want a lock which lets you store a large number of codes, and which makes it easy to add or remove them. Some keypad door locks are incredibly easy to install. They may require no wiring, which means you can get them set up and working within minutes, even if you have no experience with electrical systems. 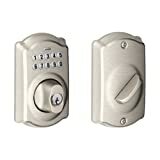 Others on the other hand can require some knowledge of electrical engineering in order to get them installed, so buy a lock which fits your skill level. If you are pushing the same numbers in a keypad door lock over and over again, over time, you can imagine that those numbers might start wearing own. If that were to happen, anyone who wanted to gain entry would be able to look for the worn-down buttons and see which numbers were being pushed. They would then have a significantly easier job cracking the entry code since there would be fewer combinations to try. This is why the best keypad door locks have coating on the keypads which prevents this kind of wear. That way would-be intruders will not be able to guess which buttons are used to type in the code. Not all keypad door locks fit all doors. Make sure that the one you are considering will fit the size of your door, and that it will also work with the material of your door. Take note of whether your door is left- or right-hinged as well and whether the lock is compatible. 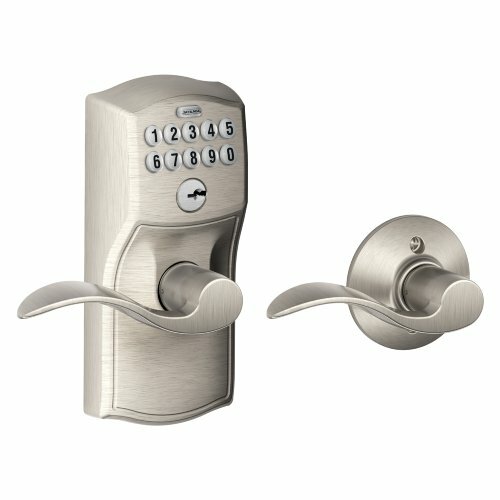 When you think of locks, there is a good chance that you think of Schlage. One of the company’s most popular and highly rated locks today is the BE365VCAM619 Camelot Keypad Deadbolt. Available in a range of sleek finishes, this deadbolt has earned numerous positive reviews online and offers a range of convenient features. Keep in mind that this is not a smart lock. The Schlage BE365VCAM619 has a Grade 2 Higher Residential Security Rating, and is guaranteed by the manufacturer to fit on standard doors. Additionally, it has a silicone coating, which prevents wear and tear on the keypad. Store up to 19 different access codes. Install the door lock quickly and easily without the need for wiring. Low-battery indicator included. The battery drains very slowly, so you should be able to go years without a replacement. Keypad is backlit so you can see what you are doing at night. This keypad comes backed by a 3-year limited warranty on electronics and a lifetime warranty on the finish and mechanics. There may be issues with quality control. A minority of buyers reported some kind of mechanical or electronic failure with the lock. Thankfully, the vast majority have shared nothing but good experiences. 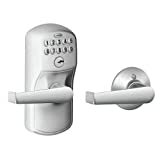 Another popular keypad lock to consider is the YL 99 Keyless Electronic lock from SoHoMiLL. This lock can be used on both right- and left-hinged doors, and is constructed out of sturdy all-weather stainless steel. It is designed to be fast and easy to install; the only tool needed is a screwdriver. This lock is compatible with most doors, even garage entry doors. Along with the master code, up to 8 user codes and a passage code can be stored. The master code is used to control the other codes. You do not need anything more than a single basic tool for installation. A low power warning lets you know when it is time to change the batteries. There is also a backup battery box jumper. The lock auto-locks from the outside after three seconds. There is a beep when you use the door which some users find annoying (it is an important security feature however). Some users mentioned that the locks do not hold up all that well to heavy rain and snow, but a coat of clear spray lacquer and silicone can help to prevent damage. 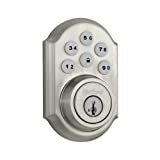 Also worth considering in the category of keypad door locks is the Kwikset 909 SmartCode Electronic Deadbolt. This lock is available in three beautiful finishes: satin nickel, polished brass, or Venetian bronze. As with the other locks discussed above, no complicated installation is required. All you need to get the job done is a screwdriver. Installation could not be easier. You do not even need to make screw holes. This lock can support up to 8 custom codes as well as a master code (the master code is optional). The keypad is backlit so that the lock can be used easily at night. The lock is ANSI/BHMA grade 2 certified. The cover of the lock is tamper-resistant. There is a 1 year warranty on electronics and a lifetime warranty on mechanics. There is an option to set the lock to auto-lock after 30 seconds. A backup key is included, so if the battery dies, you can still get in. It is possible to turn off the sound if it annoys you. A few customers reported quality control issues (failing buttons, etc.). They were in the minority however, with the vast majority sharing only great feedback.